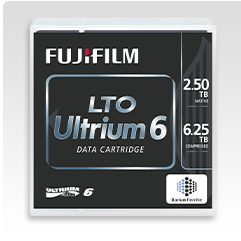 FUJIFILM Corporation (President: Shigehiro Nakajima) announced that it will launch FUJIFILM LTO Ultrium 7 Data Cartridge (LTO7) on November 18, 2015. Adhering to the 7th generation “LTO Ultrium standards*” for magnetic tape media, the LTO7 will allow for backup and archive of large volumes of data, high-speed data transfer at 750 MB/sec. (300 MB/sec. for non-compressed data), and offer a storage capacity of 15.0 TB (6.0 TB for non-compressed data). SYDNEY, 19 January 2015 – FUJIFILM, the company with the largest LTO tape manufacturing share in the world, regularly conducts quality control tests including writing and reading brand-new media at the end of the manufacturing process. As a result the company has a significant amount of accumulated test data which when amassed and evaluated proves that by using Barium Ferrite (BaFe) LTO tapes over standard metal particle LTO tapes the LTO drives can last up to 60% longer. Fujinon lenses have a reputation for quality and durability so when a lens purchased by the National Broadcasting Corporation of Papua New Guinea (NBCPNG) was found to be in a state of disrepair the company sprang into action to restore it. The 42nd ACS National Awards for Cinematography held in Canberra last weekend at Old Parliament House saw amongst other things much revelry, Jonathon Rossiter ACS winning the Milli Award for Australian Cinematographer of the Year and Fujinon Fujifilm again reaffirming its longterm commitment as Major National Sponsor of the Australian Cinematography Society. Fujifilm Australia is again the major sponsor for the upcoming 2013 Bunnamagoo Mudfest – Mudgee International Short Film Festival. Mudfest, now in its 9th year, regularly attracts over 1000 people to watch of some of the best short films from Australia and around the globe. State of the art post production facility Deluxe Sydney recently completed Hugh Jackman’s The Wolverine undertaking data management and dailies production. A significant part of this project involved using Fujifilm LTO tape for archive, storage and secure data management. SYDNEY, 19 December 2012 – In a move sure to please all the members of the ACS and their many associates, Fujifilm and Fujinon have again reaffirmed their commitment to the society by extending their role as Major National Sponsor for 2013. SYDNEY, 10 December 2012 – Fujifilm today announced that well known industry figure Simon Becker has joined their team as National Sales Manager for Fujinon products in Australia and New Zealand. SYDNEY, 4 December 2012 – Fujifilm Australia today announced that it had launched the first LTO-6 data cartridge in Australia and New Zealand. Fujifilm’s LTO-6 cartridges are the only LTO media that has achieved the very high capacity of up to 6.25TB compressed with a transfer rate of up to 400MB/second by applying Fujifilm’s unique Barium Ferrite magnetic particles in combination with Fujifilm’s current NANOCUBIC technology2.